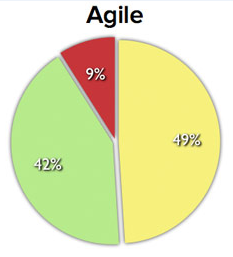 According to the 2012 CHAOS report, Agile succeeds three times more often than waterfall. Because the use of Agile methodologies helps companies work more efficiently and deliver winning results, Agile adoption is constantly increasing. There have been some significant increases in all aspects of agile adoption from 2011 to 2012. – The number of those who plan to implement agile development in future projects has increased from 59% in 2011 to 83% in 2012. – 52% of companies state the the biggest barrier to Agile adoption is the inability to change organizational culture.